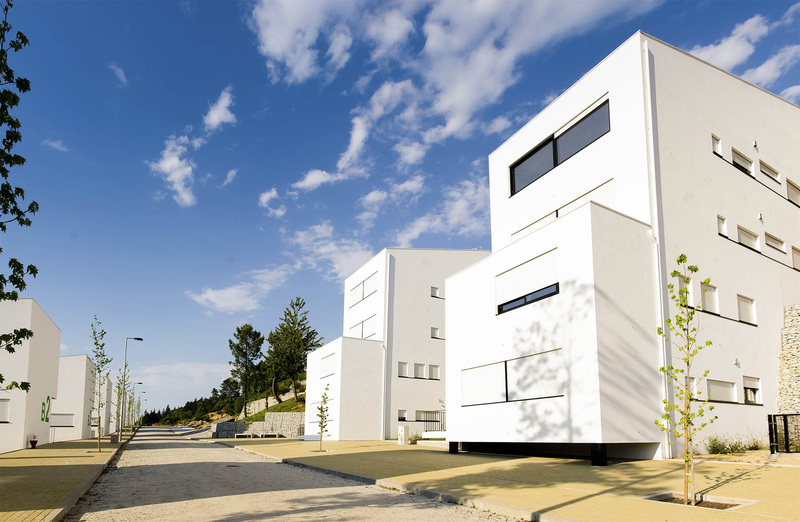 Cost of construction max: Controlled-cost houses, where the cost of housing is 505.00 € / m2, wich compared with the average cost of 650.00 € / m2 for current construction is equivalent to a reduction of 22.30%. 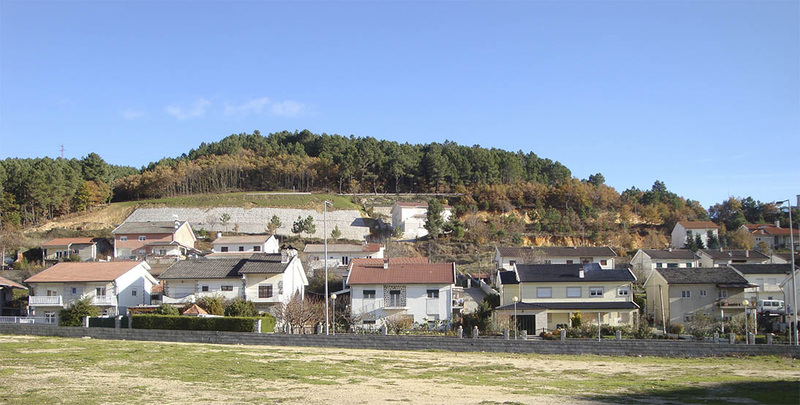 Rental/sale cost compared to market price: The rent is indexed to the monthly income of the needy family, varying between the minimum of 4.19€ and the maximum of 81.36€, wich represent a reduction of 60 to 99% comparing the free market values. 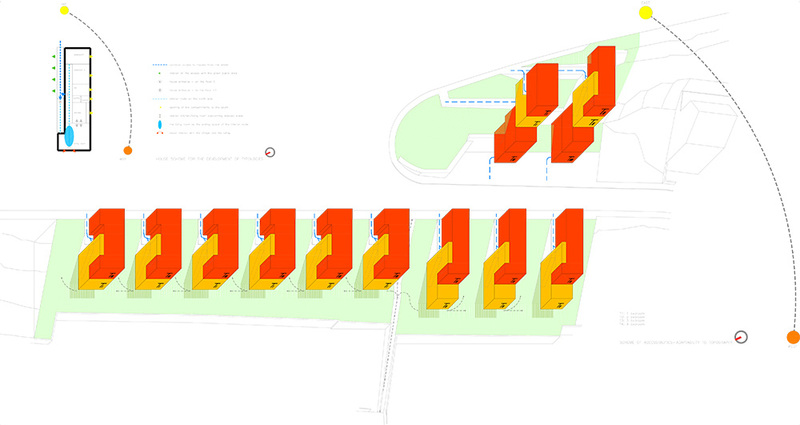 Rules of allocation: The entire project is intended to reduced rent regime for needy families. Protection of fragile categories: It is 100% to needy families, prioritying: Single-parent families or including minors; Families with disabled persons or persons over 65; Families who are victims of domestic violence. 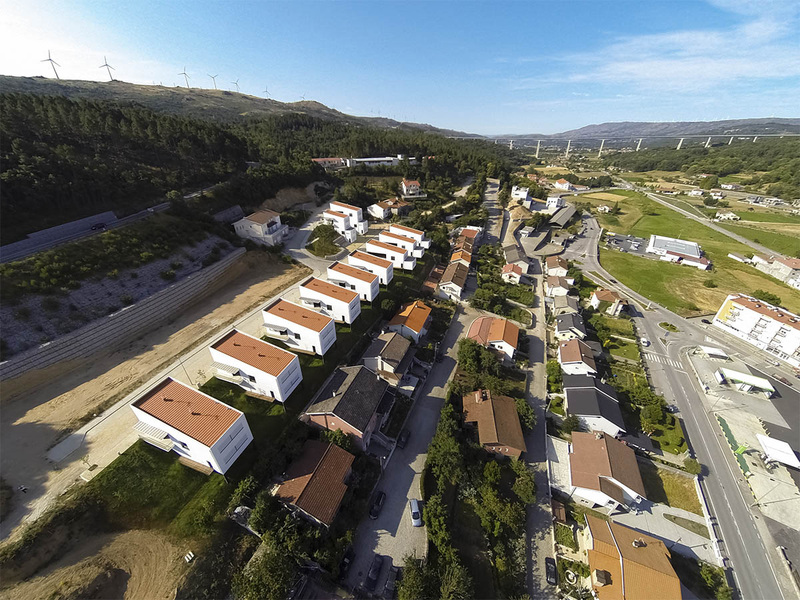 Involvement of inhabitants in the building process: The process of assigning the houses by the municipality was subject to an announcement of candidacy, whose evaluation followed the procedure and public scrutiny, so there couldn´t be previous relations. Community accompaniment in the life of the building: The residents are organized and are presenting their suggestions for improvement to the municipality, highlighting the consolidation of the already trampled footpaths of articulation with the city, which reinforces the predicted in the project. 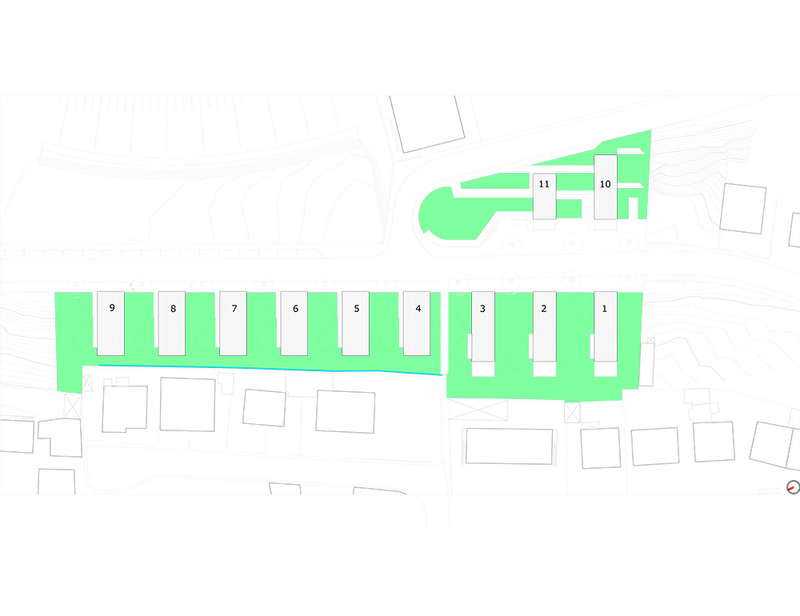 Common spaces and shared living: All area around and under the blocks is public, allowing continuous paths of connection of the complex and from it with the city, promoting local vitality and social life as well as urban proximity and social integration. 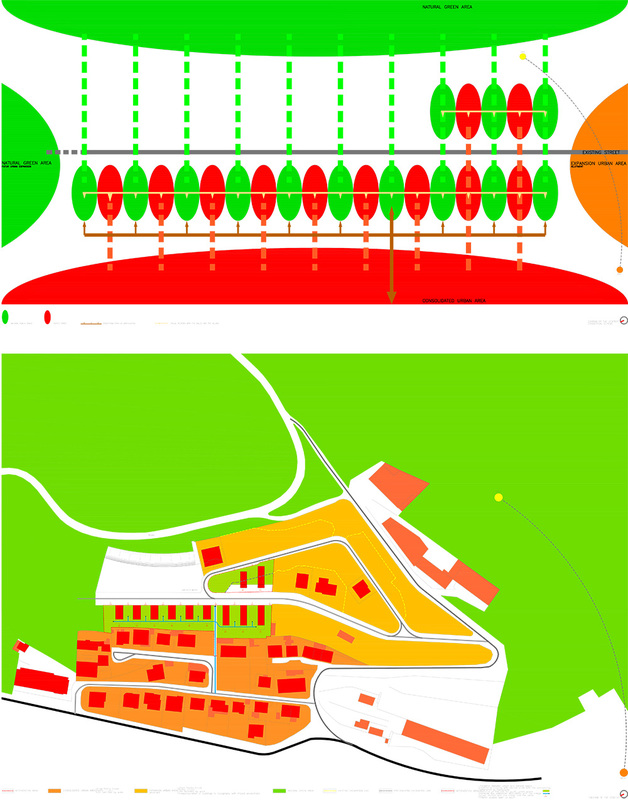 Techniques and strategies for environmental saving: It avoids land movements and respects soil permeability and drainage. The blocks ripped south integrate the natural lighting and heating. 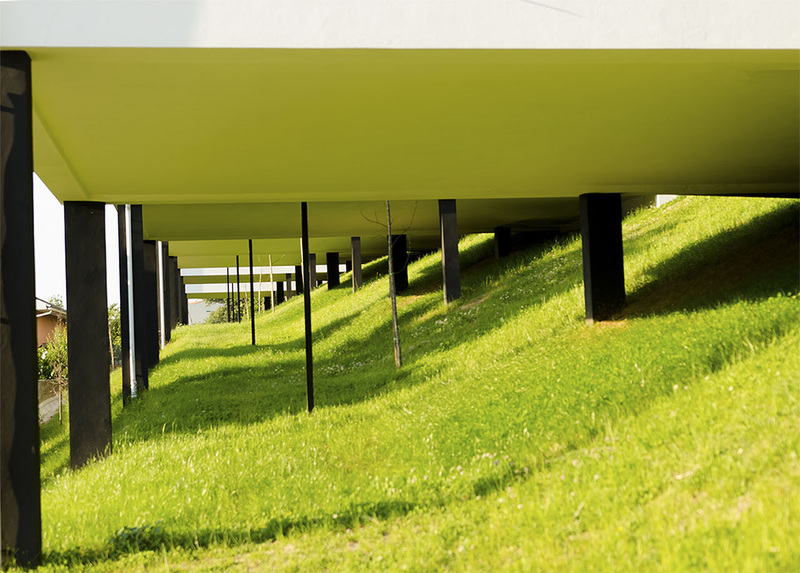 The language respond to the essential and the materials are based on clean production and easy maintenance. 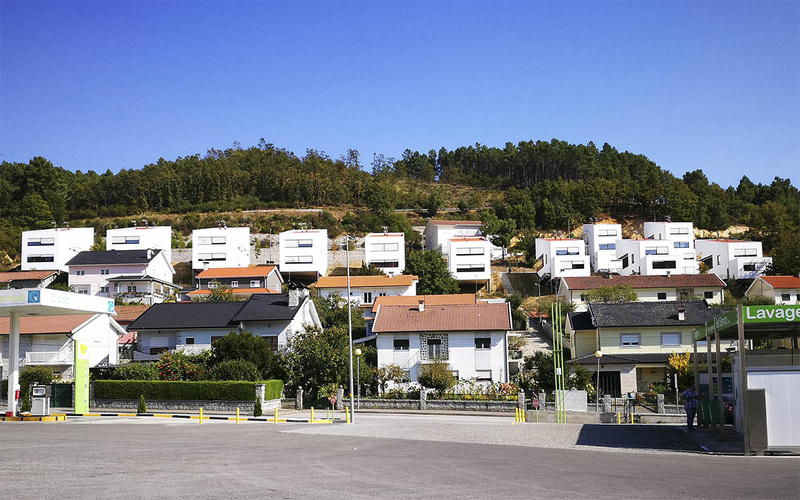 It is located on the slope of the village in a zone of slow urban expansion hanged in a street without continuity, delimited inferiorly by the walls of the lots of the neighboring houses and superiorly by the proximity of the forest. 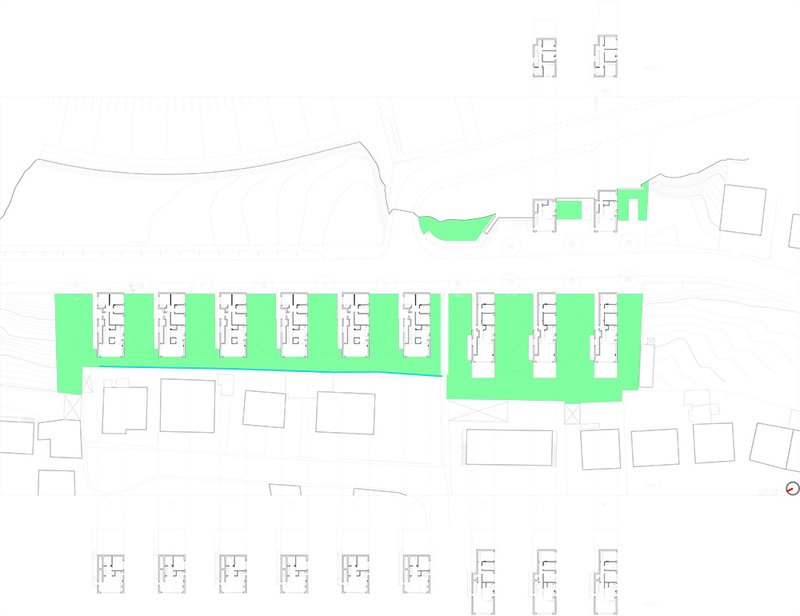 In opposition to the closed lots and severus land excavations, the proposal sought the constructive demassification and the balanced transition of the urban space with the natural one implanting longitudinal blocks perpendicular to the contour lines and to the existing street, establishing a succession of edified spaces and natural public spaces perspectived to the village. 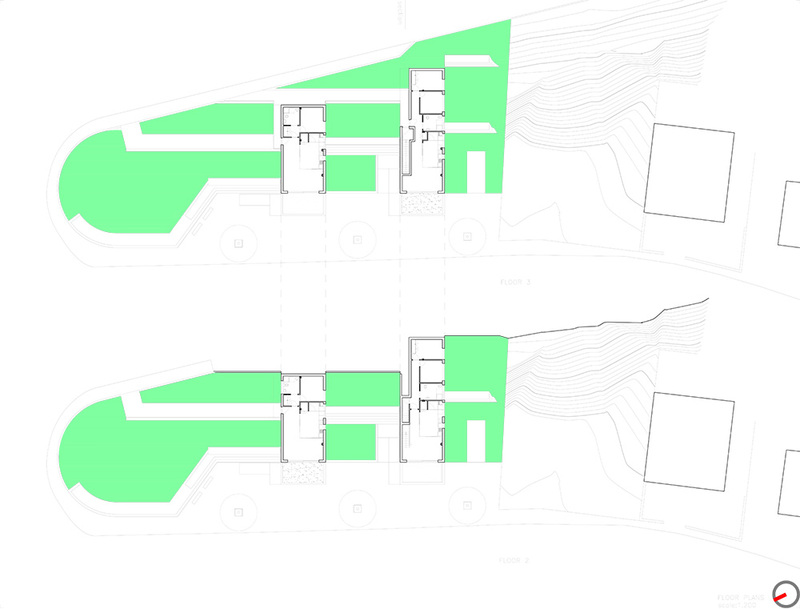 In contact with the pre-existing sloping ground, the blocks create a leaked covered area, which allows the continuity of the public space and the establishment of a transverse path of articulation of the complex and, through consolidating a narrow strip between the Neighboring walled lots, with the village compensating the isolation of the place, promoting the relations with the city, the multifunctionality of public space and social integration. 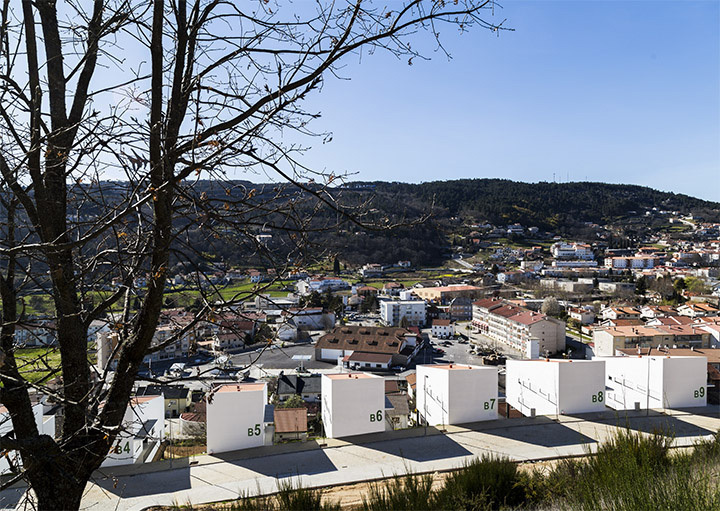 The blocks adapt to the plot outlines, to the topography and to the heights of the neighboring houses, relating volumetrically to each other, whose factors are resources in the establishment of the typologies, their combinations and distributions. 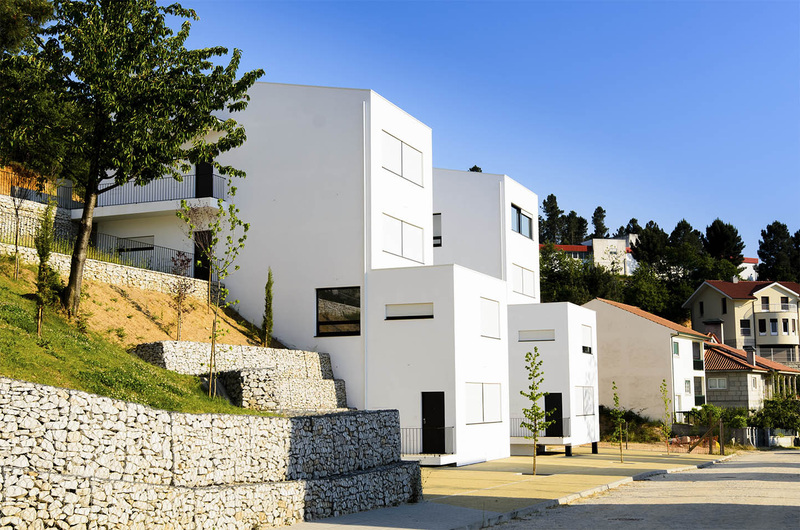 The idea of adaptable house for these blocks was based on a structural route at the north side that organizes the compartments opened to south and ends in the living room where is offered the contemplation of the village. 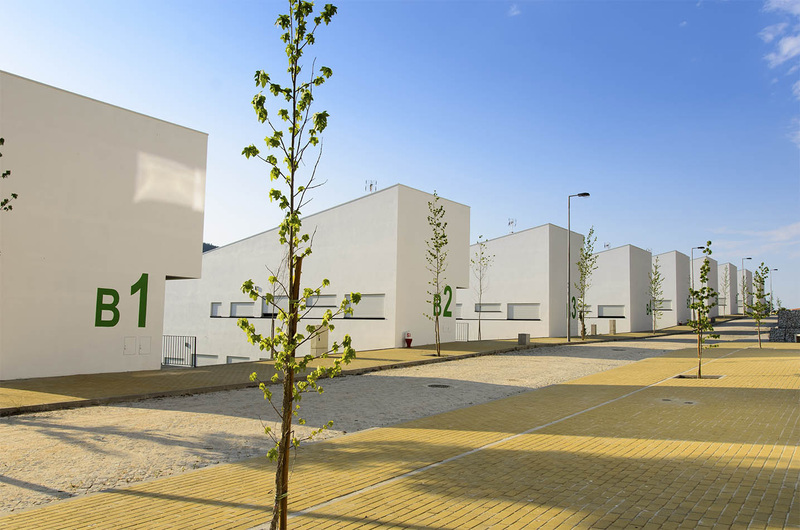 Eleven blocks with 4 different typological associations were implanted: six T2/T2 blocks; Three T1/T3; one T3/T1/T1 and one T4/T2/T2, making up the number and typologies of the municipal program. 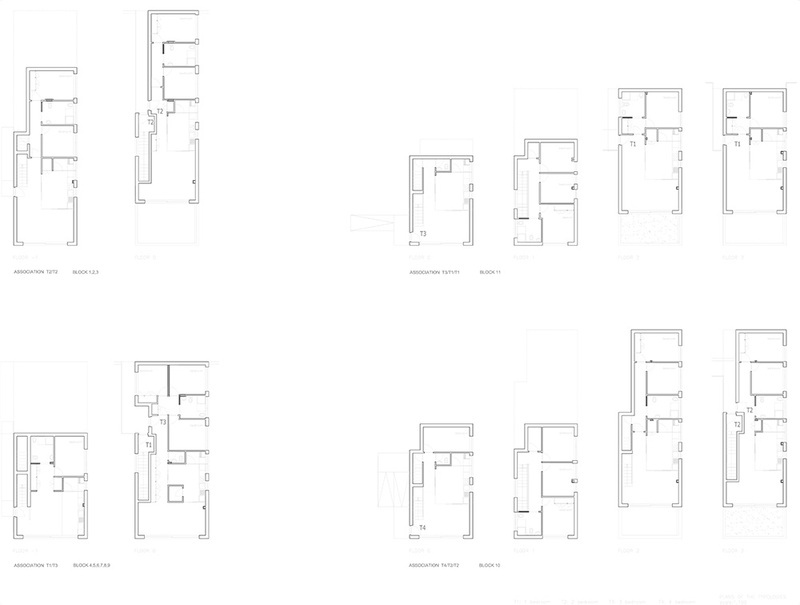 The facades are in accordance with the logic of the proposal: the West assumes the large window open to the village, the East announces the blocks, the North, opened to the public space, reflects the common access and the South, ripped, reinforces the longitudinality of the block on relation Nature/city and promotes natural lighting and heating for the energy costs reduction. 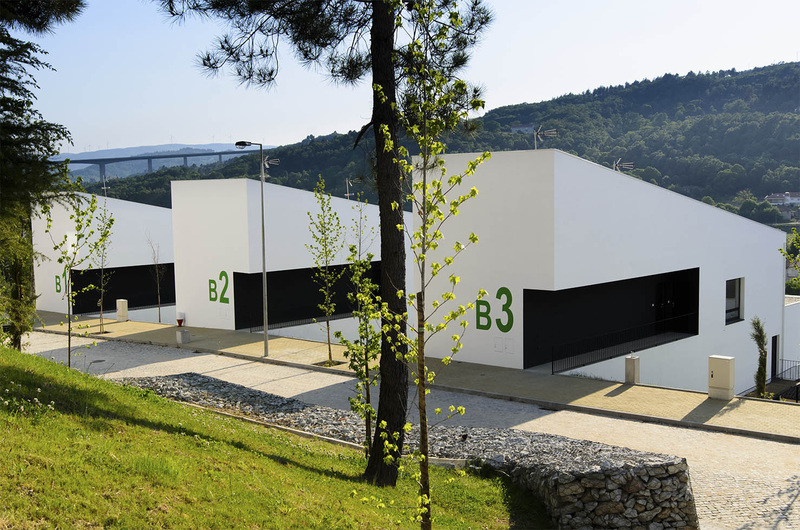 The white exterior walls and the black aluminium windows clarify the ideia and reflect the objectivity in the use of the exterior materials extendable to the interior, contributing to the reduction of construction and maintenance costs.